Introducing the Shag sock collection full of fun designs, bright colors, and humor with a mid-century feel. 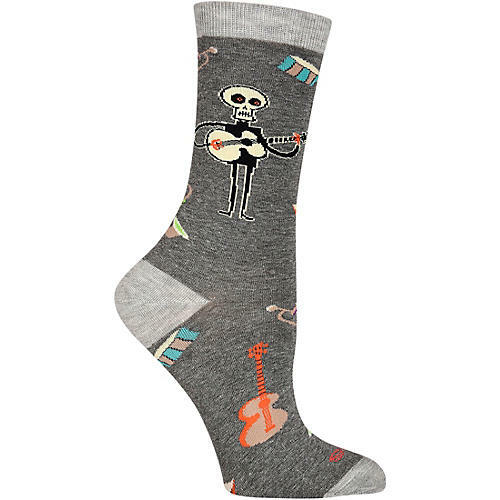 The Women's Shag Skeleton Socks features a guitar-playing skeleton surrounded by other musical instruments. Made from a soft cotton/nylon blend, these sleek dress charcoal heather crew socks will upgrade any sock drawer. Shag is a painter, designer and illustrator working in Southern California. His distinctive artistic style draws from commercial illustration from the past five decades, but the work is imbued with an attitude and sly sense of humor which is unmistakably of our time. 1 pair per package. Imported.